The new Gratemate GRN grating rope protector is specially designed for metal or composite grating walkways (‘Kennedy” type grating) found in offshore platforms and petrochemical/process sites. The protector is constructed of super tough GRN (glass reinforced nylon) giving unrivalled strength and durability. 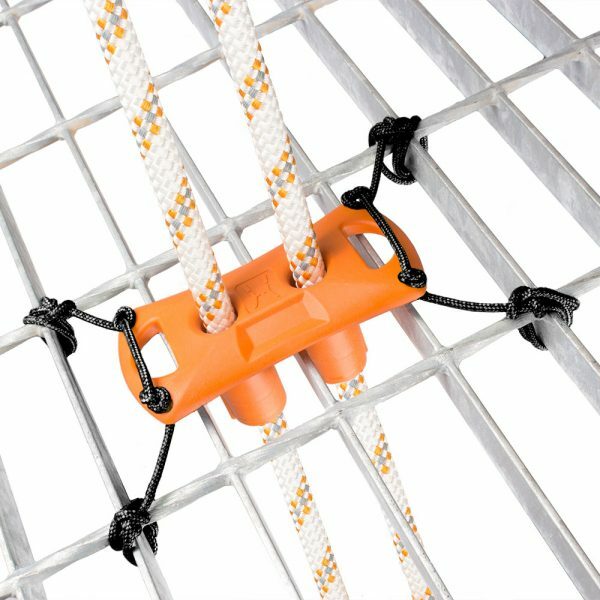 The lightweight protector accommodates two ropes via separate apertures to prevent rope on rope friction and is fit using the 4 chord attachments points. No tools are needed to fit therefore the risk of dropped objects is prevented. As the rope channels are mounted separately in the body, the protector can straddle the transverse bars of grating allowing it to fit a larger range of sizes. The GRN construction ensures improved corrosion resistance and increased durability. Maximum rope diameter is 13 mm. To download our guide on Rope and Edge Protection click here.